Here's my first go at a Frankenpattern - the bodice is good old Simplicity 2444, and the skirt is Serendipity Studios Sabrina Tunic. This is what happened... 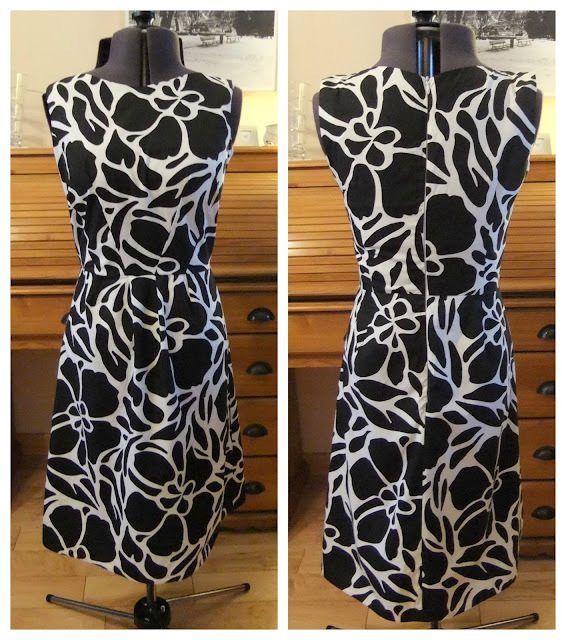 The Sabrina Tunic was one of the first patterns I bought and I had been planning to make it for a while, but it kept getting bumped down the queue - you know how it goes! So anyway, I traced the pattern, and realised the bodice was really short. Now, being pretty short myself, short bodices are not a problem I've encountered before; so I googled it, and found the pattern link on the Serendipity Studios web site. In the description it says it's empire waist, which would explain the bodice length, and empire line is not a good look on me. It was difficult to tell from the photo on the pattern envelope that it was an empire line (it's the photo on the right on the pattern link page), it's even a bit hard to see on the model in the photo on the left because the lower sash seems to pull the waist in a bit. I'm generally not a big fan of a sash, although I do think it looks lovely on this, but it wasn't the look I had in mind. I briefly thought about lengthening the bodice, but I just couldn't be bothered! Then I thought, "I know! I'll use the bodice from Simplicity 2444, and the skirt from Sabrina". And the reason this is most definitely a Frankenpattern is because I had that idea when I was watching a thunder storm from the box room window! The bodice came together easily as I've made it twice before (here and here). Sadly the lovely darts got a bit lost in the print on the fabric. The skirt on the Sabrina Tunic is supposed to be gathered, but I thought it would look nicer with darts that corresponded with the darts on the bodice. This was were having my dress form was invaluable. I put the bodice on the dress form, and just mucked about with the skirt pattern pieces until I was happy that the darts matched up with the darts on the bodice. It did take a bit of time though. I winged it with the length of the darts, and ended up having to length the front outside darts and the back darts. I'm very pleased with how the top of the invisible zip turned out, I usually make a bit of a mess of that bit! Sadly the rest of the zip isn't as invisible as it should be! The fabric is cotton poplin from Minerva Crafts, they don't seem to have it anymore though. I made a skirt with this earlier in the year, and had 1m 10cm of it left. It was 60 inches wide, which was how I managed to squeeze this dress out of it. This style of dress is new to me, as I have so far made dresses with big skirts. I wasn't sure if I would be happy with this more fitted skirt, but I really like it. Thank you! I intend to make more dresses in this style now. Love that! Works really well and looks great on you - the matching darts on the bodice and skirt are brill. You definitely need to do another version in a plainer fabric so they stand out more. Thank you! I'm glad you could see the darts, I didn't think they showed up too well in the photos. Love this dress, it has a great early 60's shape to it. Well done for your pattern hack, it really worked out! Love the look of those front darts, really dramatic. Gorgeous! This is a really beautiful dress Lynne, and such a good shape for you too! I see you got your fabric from Minerva - I haven't ordered from them before but was looking at them the other day and was wondering if they charge the same postage for NI as the rest of the UK? Isn't it so frustrating and ridiculous when companies charge extra for delivery to NI....even when they use Royal Mail?!! Makes me so mad! I shall have to have a gander at Minerva. I'm looking to start a little fabric stash and I see a lot of bloggers mentioning them. I can only assume good things. Beautiful dress! I love that you 'winged' it and designed it yourself. Good ol' S2444 bodice - it really is a gem isn't it? 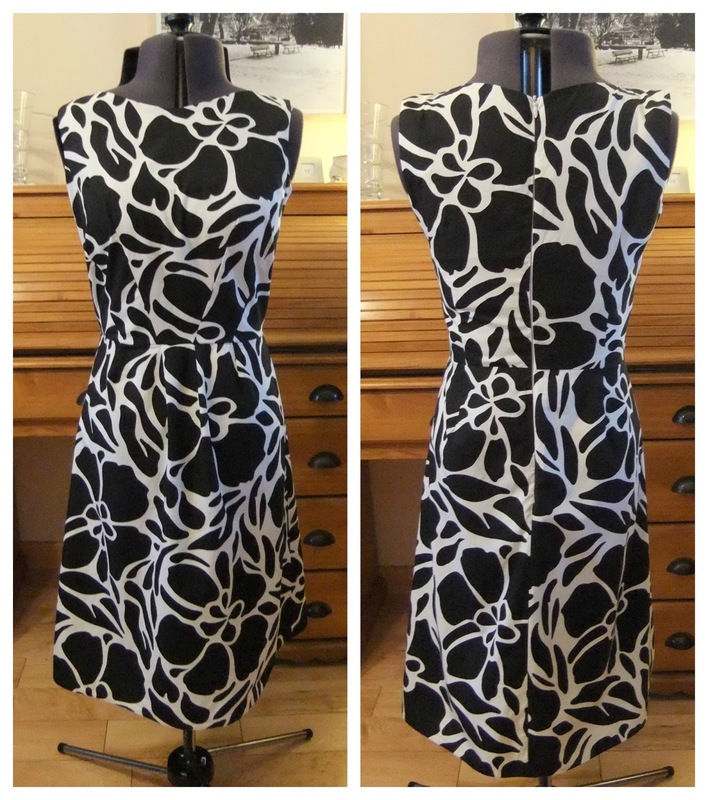 I love how you've paired it with the narrower skirt - it's knockout in this fabric! And a great top of zip- hurray for cracking it! Thank you! And thanks again for the zip tutorial, it was a big help. Thank you! Good luck with the zip teaching, I tried to teach my sister to crochet once, and had to take some headache tablets when she left my house!